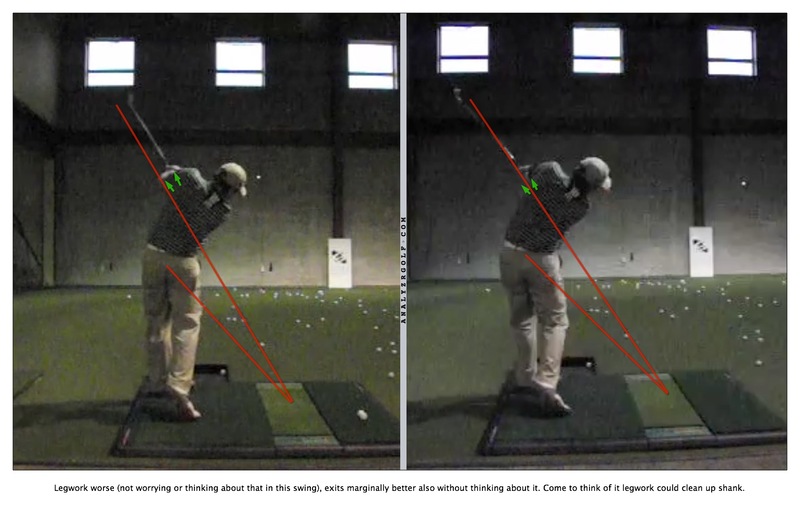 Would you consider your hips in a "reverse" position in the backswing? 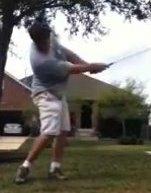 Seems that you could move the belt buckle back during the backswing and still give yourself the excellent left tilt that you have. Right now it seems that your hips start going forward in the backswing and then have trouble going "more forward" because they are already pretty forward. Sort of a Zack Johnson-esque move. Certainly I am not trying to criticize, but learn with my comments. 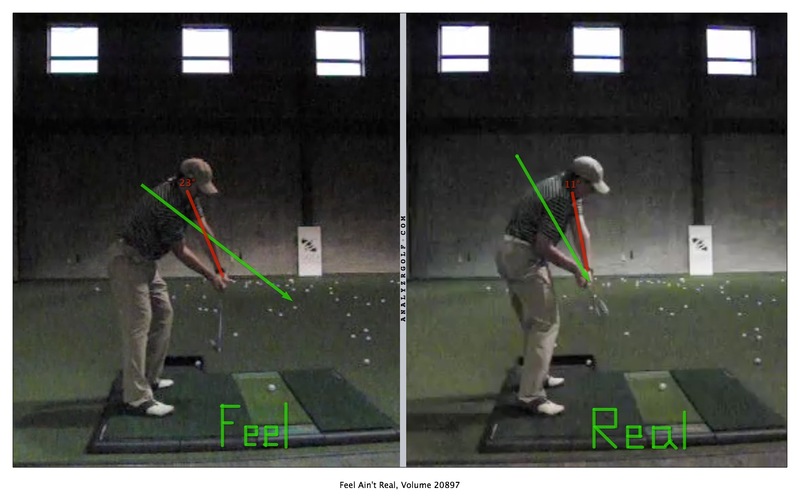 I cannot see the full swing so I am only guessing about the hip movement. Criticize away! :-) That's why they're here. And I didn't mention it (or did I?) 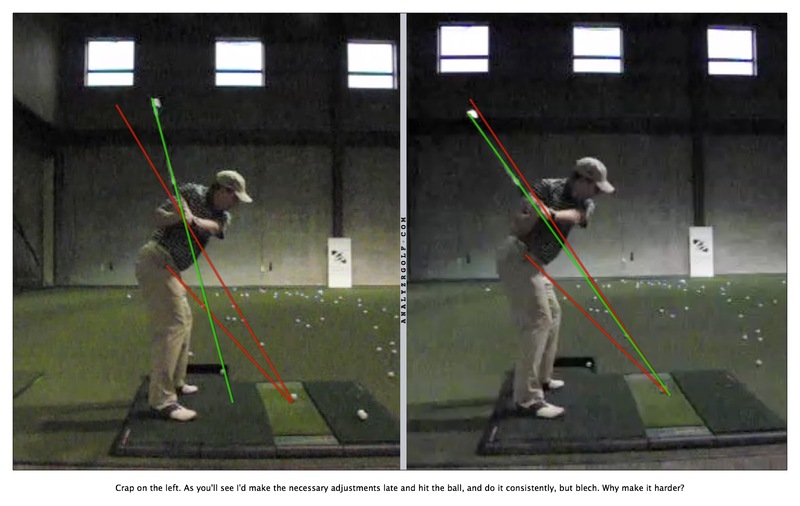 but I specifically posted the second image because it has the green lines on my hips, drawn at setup and clearly you can see a bit of "reverse hip slide" (to others not named Mike: it's reversed because in the backswing, if anything, the hips can go slightly to the golfer's right). Troy Matteson gets away with it but he does some other things I don't do, so it works with him. 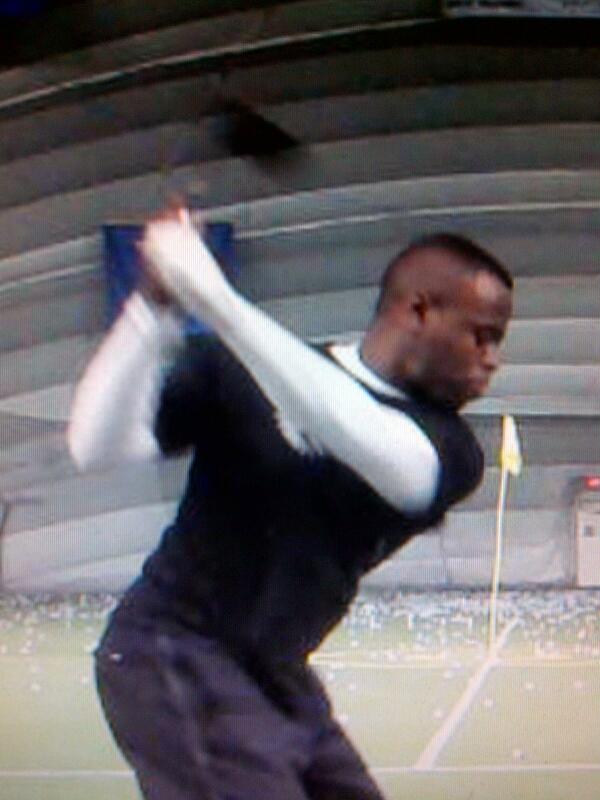 The reverse hip slide pulls my head just that little bit forward, yeah. It may seem odd to people, but I'm going to spend some time feeling that I slide my hips back to the right a little bit. 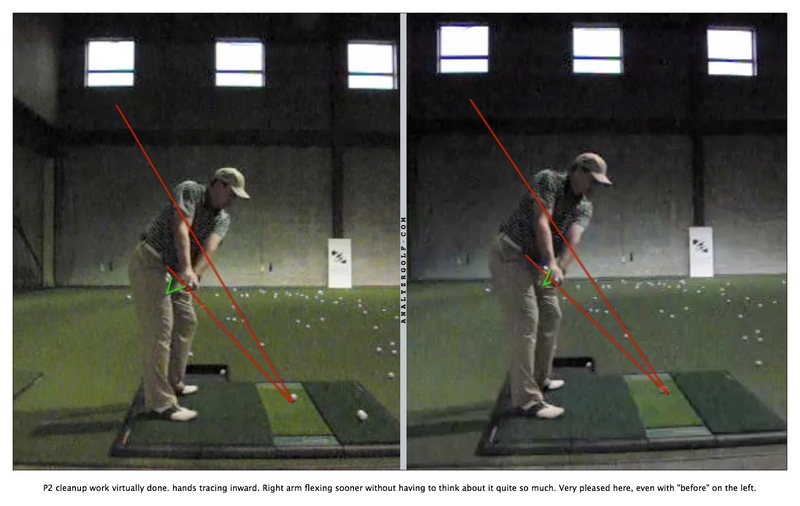 The idea is to stay centered, not to slide left during the backswing. You're dead on with the "have trouble going more forward" but I also have to spin them a bit given the steepness of the shaft from P4.2 to P5. That also prevents them from going forward a little bit. 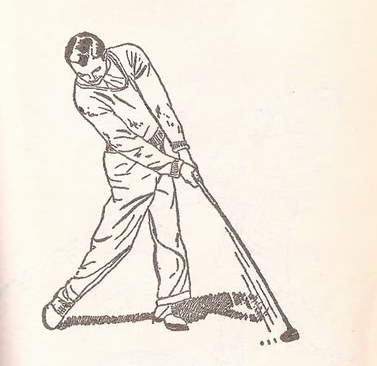 And that reason right there - that they spin a little prematurely rather than going forward a little longer - is why the reverse hip slide is a lower priority than cleaning up the clubhead movement via wrist conditions from P3.8 to P4.2. More still photos coming later. Of the six additional balls I hit, I hit two "normal" ones and the other four were "working" on something. Yeah looking nice. 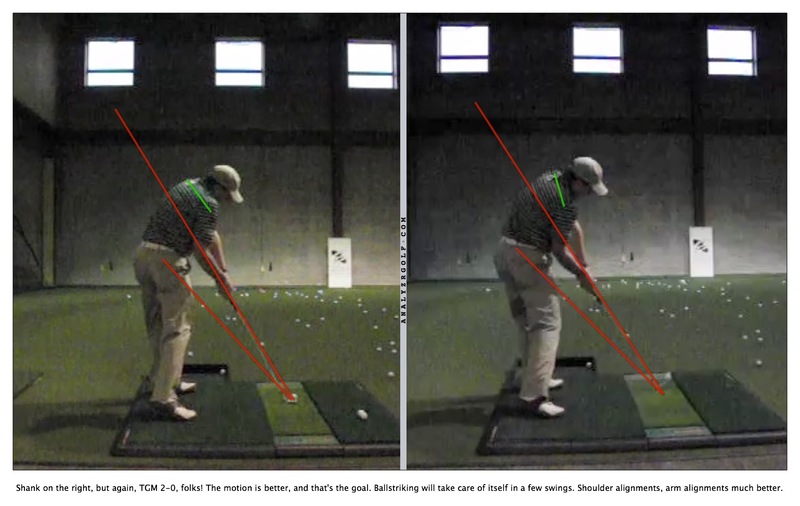 I had the same sort of problem, hips too far forward in the backswing where I couldn't slide them in the downswing. Tried having less weight forward to begin with and it seems to be working. NIce, Erik. The new Golf Evolution indoor facility looks really choice too! Changed the picture, my man. 2-0. Of the six additional balls I hit, I hit two "normal" ones and the other four were "working" on something. Come on Erik. You really never stop working on the somethings now, do you... . Nice post. Erik, in order to get rid of the "scrunched shoulder" look on the left picture, do you work on "feeling" like your left shoulder is moving "out to right field" on the way down? Also, if so, is that what helps to drop your hands on and your club under the top red plane line that is illustrated in the photo? ON the photo in the left, it looks like your left shoulder has rotaed left and down almost creating a mini OTT move and moving the shoulder out to the right on the way down is the only way I can figure out how you fixed that. P.S. Given the "feeling" I was after, I think you can understand why Dave and I both though there was a good chance I'd shank a few. That makes a ton of sense, thank you for sharing. 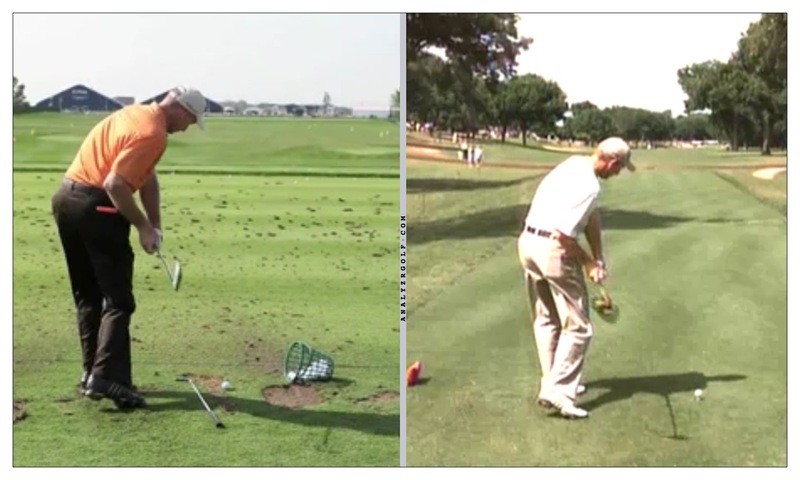 Pinch elbow is what I see all the guys on tour accomplish quite consistently (especially Jim Furyk; however, he's a bit of a unique case and maybe a bit extreme the other way). 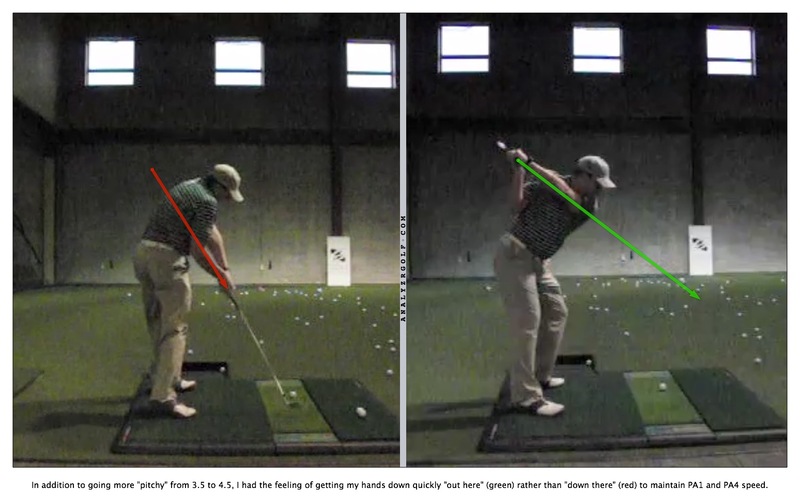 I have a hunch that a "pinch" elbow can help to generate a bit more speed/power? I also really like the "out there" and "down there" explanation you made. 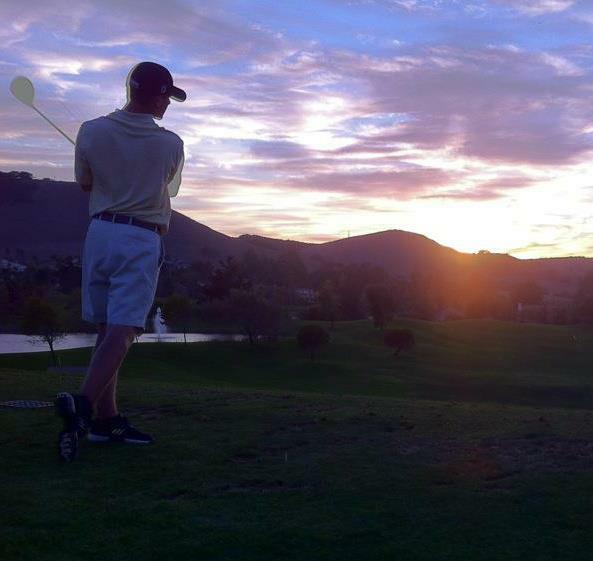 It really brings clarity to what you are trying to accomplish and is a great tip for anyone really...especially lower handicaps. There's really no such thing as "pinch elbow." It's kind of the name I've given to the position that's not quite pitch and not quite punch. 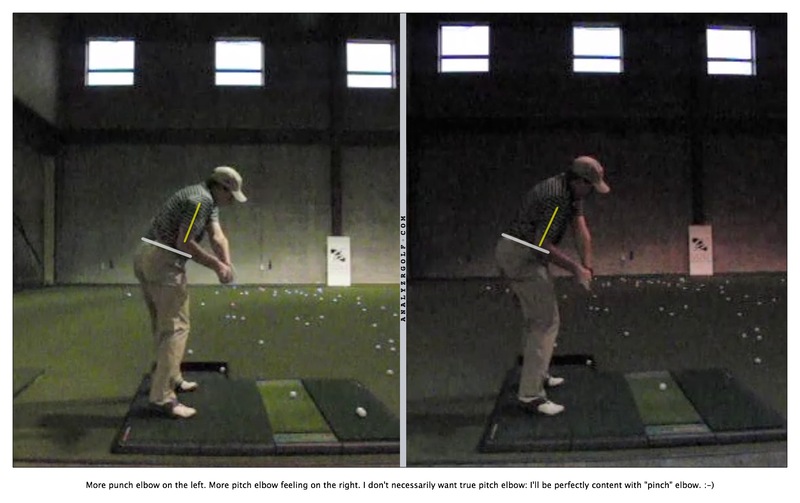 Combine the two - to get the position that's "kind of in the middle" - and you get "pinch." Jim Furyk is nowhere near pitch elbow. 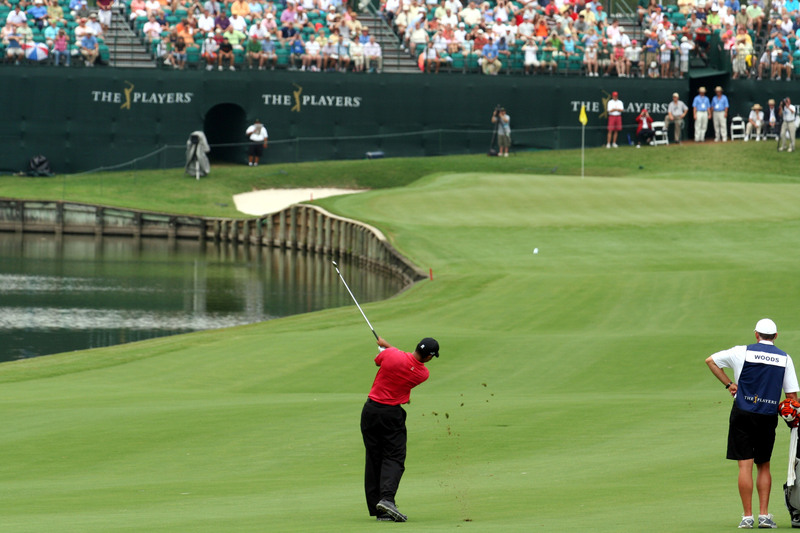 On the PGA Tour a lot of players are closer to pitch than punch, though, I would agree with that. More speed and power? Debatable (depends on a lot of things). But in the normal case, I think it's more likely to help than to hurt. Video posted for two reasons. I didn't realize I hadn't posted it yet. Some of you may find it fun that I shank it. TGM 2-0. Make the correct motion even if you miss the ball until you no longer miss the ball. ;-) Or, in this case, until you no longer shank it. Good stuff Erik. I think what happens to most is that they'll work on feeling something different to change the picture, get a bad result, (a shank in this case) and then say, "it doesn't work". Ditch it and try something else. 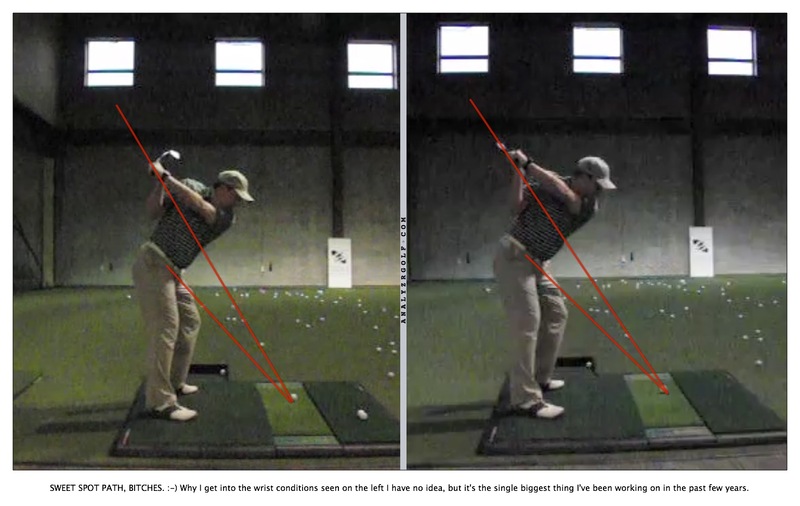 What you're trying to do isn't wrong, we know what's correct because we Understand what an efficient golf swing entails, but when we exaggerate and start changing feels our sequencing needs time to catch up. What the heck are you hitting into? Is there a net that doesn't show on camera?